These 2 also worked together on Time to Pray. I just reviewed the story a few days ago here. This story was unavailable in my library so I requested a review copy from Boyds Mill Press. I have really been enjoying their diverse stories lately! Mid-Ramadan is a special time. Noor lives in a country near the Arabian (Persian) Gulf. She’s looking forward to the festival known as Girgian that comes in the middle of the holy month of Ramadan. These middle days are known as “the three whites,” because they include the day of the full moon, the day before, and the day after. It’s a time when children, dressed in traditional clothes, go from house to house collecting treats from their neighbors. When Noor sees the full moon rising, signaling the coming of Girgian, she and her brothers prepare for the fun. Together, they decorate the bags they’ll carry to collect the candies. But along with the fun, Noor remembers the true meaning of Ramadan: spending time with family and sharing with those less fortunate. My thoughts: I grew up in Abu Dhabi and was born in Bahrain so spent 13 years of my life in the Middle East. Reading this story brought back a lot of fond childish memories. We didn’t celebrate Girgian: for some reason I never heard of it until this book. I wish I had as a child. It really sounds like a fun event! This story was a special one for me and hit home – seeing Noor’s red traditional dress, and her grandfather’s crisp white dishdasha and white bushy eyebrows and mustache made me miss Abu Dhabi and I could visualize walking in the supermarket and seeing a flurry of dishdashas around me. The story’s words are fresh and the oil paintings that complement this story are absolutely gorgeous. 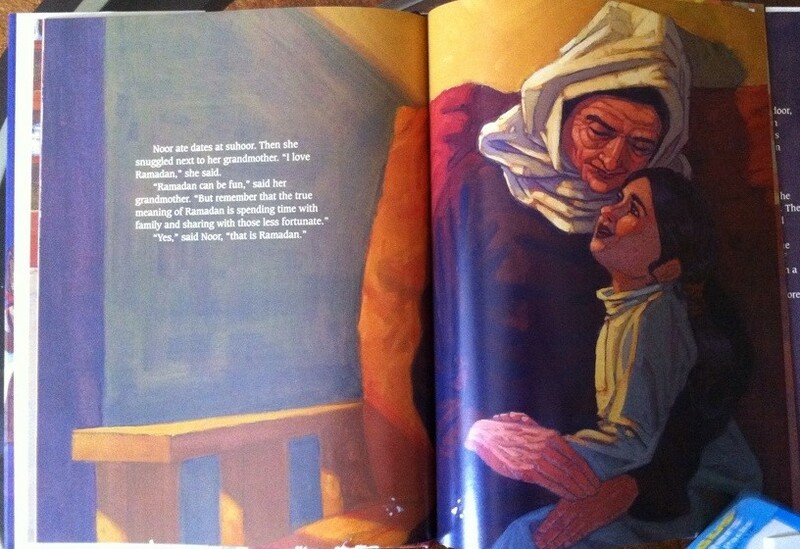 I would read this story if there were no words, that’s how beautiful the paintings are. I would also read this story if there were no pictures, that’s how beautiful the story is! Noor twirled in front of the mirror. 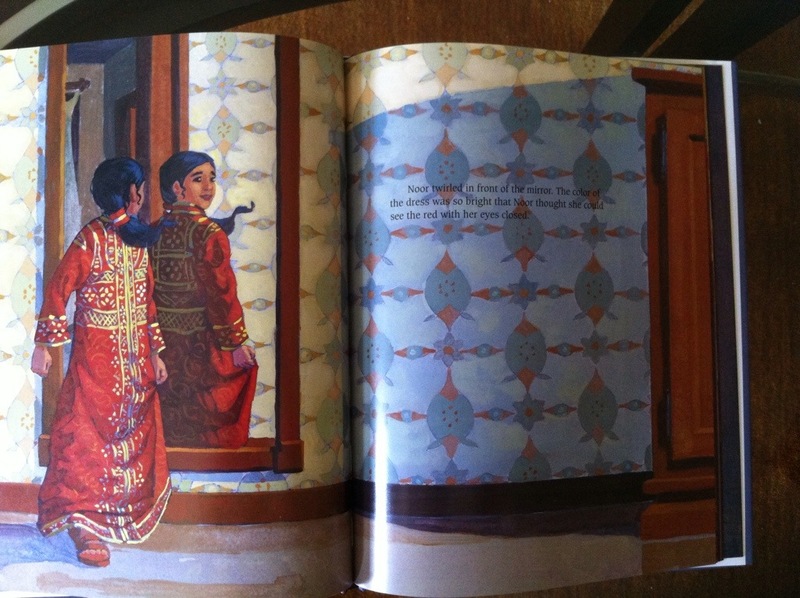 The color of the dress was so bright that Noor thought she could see the red with her eyes closed. Amazon lacked the Look Inside! feature, so here are 3 pages below! I especially love the above page, the casual way the grandfather is leaning in, and how they’re walking briskly to the masjid. 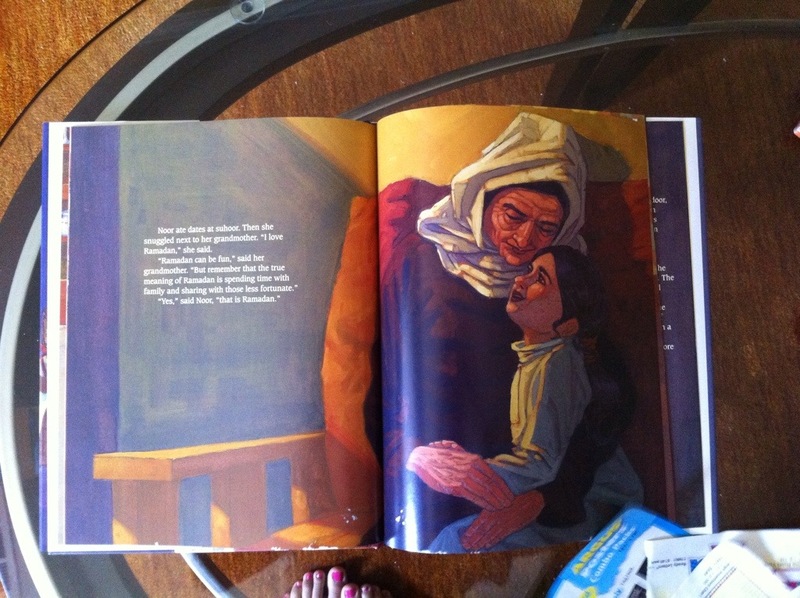 This story is a new Ramadan favorite for me! 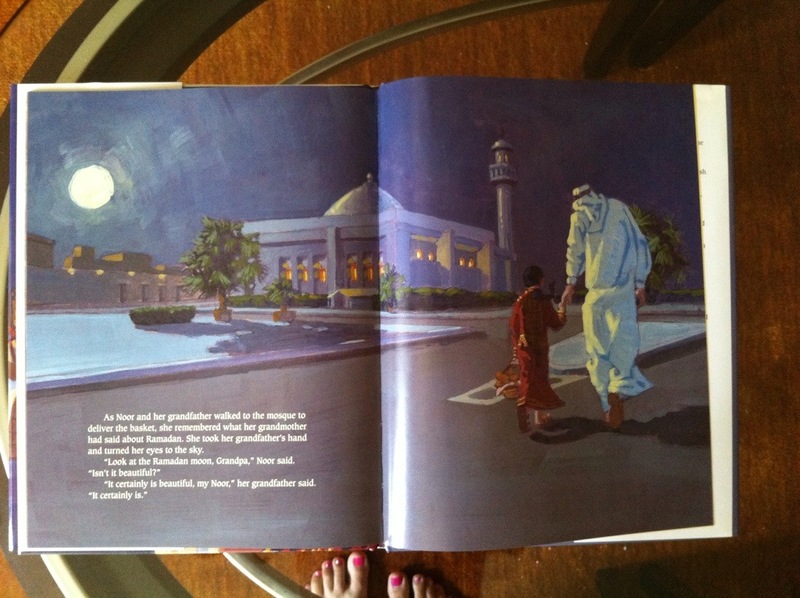 It’s also a great intro to children of all backgrounds for what Ramadan is all about.